Our wonderful boat, Why Knot, is still calmly sitting all snug in her slip in Sarasota, Florida where it is warm and all Florida-y. There has been a bit of weather that has blown through the west central Florida region but nothing horrible. We’re still in Denver. Denver is a nice place. The weather has been fantastic with lots of sun and warmth. But it ain’t the same as being on our boat in Florida. Lisa has her nose firmly planted in her computer screen taking care of the heavy-duty work that she always has to do this time of year. (It’s tax season.) I am in a bit of lull in my task list as I got a lot done back in St. Louis, but I will be picking up the pace this coming week as the timing of completing some of my tasks become more relevant to getting us ready to return to the boat. Television is boring. It is amazing that with a gazillion channels most of it is absolutely, mind-numbing gar-bahge’. Unfortunately I have become somewhat obsessed with a particular piece of trash called “Robot Combat League” on the Syfy Channel. Remember “Rock’em Sock’em Robots”? This show is that brought to human scale. Teams of two people control eight foot tall remote control robots fighting in a ring. I mean these are big time hydraulic and electronic monsters punching and duking it out. There is hydraulic fluid and electrical carnage galore. I feel ashamed of myself. 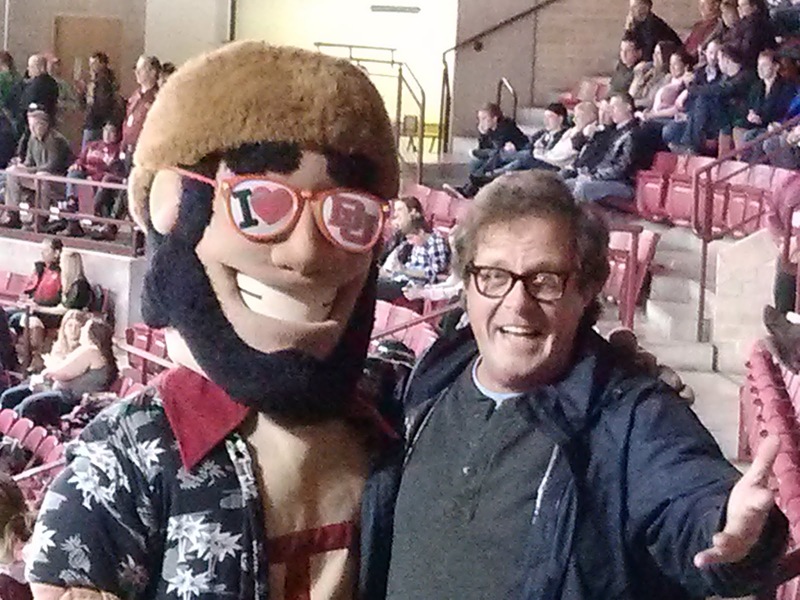 Last night (Friday) we did do something really fun. 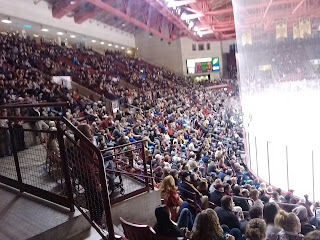 We went to see a University of Denver Pioneers NCAA Division I hockey game. 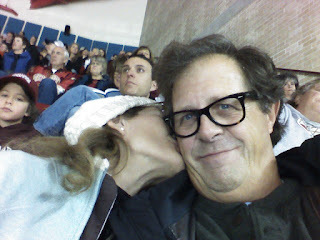 When Lisa was young her family had season tickets and she attended many many games. 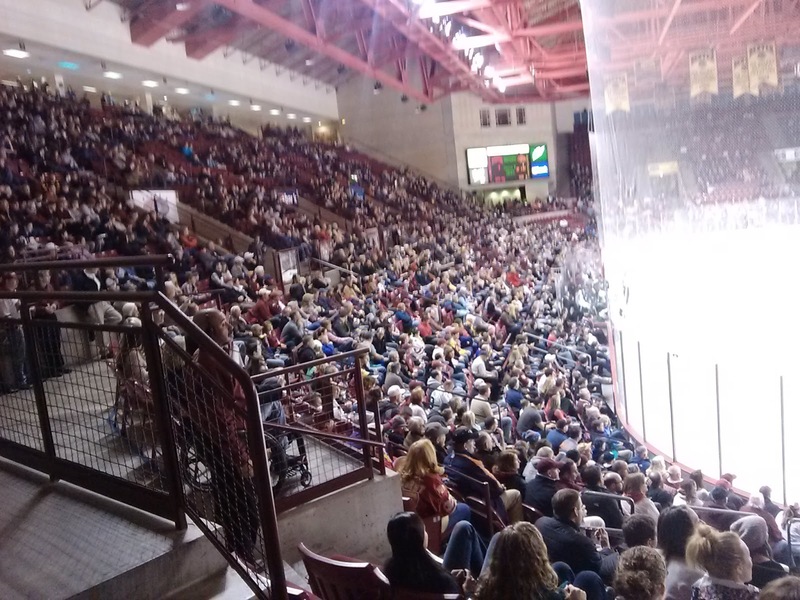 Denver is a pretty good hockey town and DU was the only game in town for a long time (pre NHL days) and the Pioneers still have a very strong following. 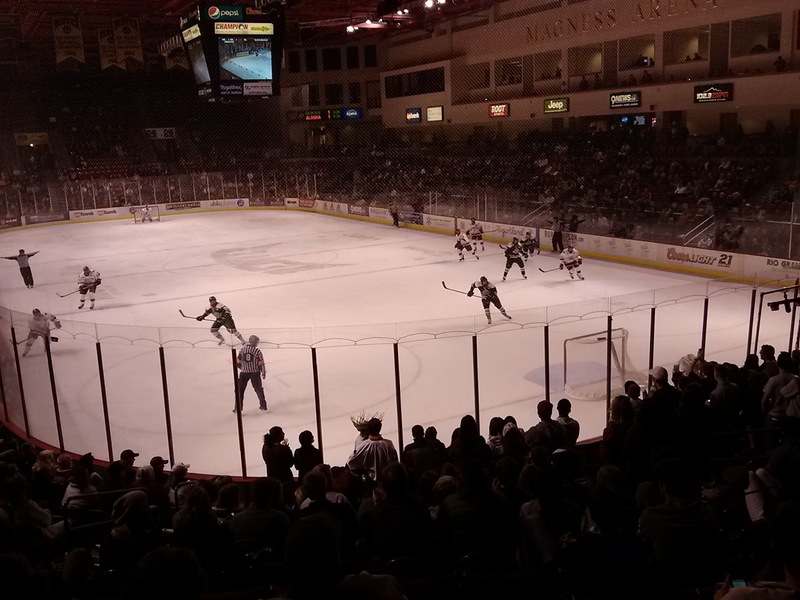 The opponents were the Seaswolves of the University of Alaska at Anchorage. The atmosphere was very fresh and exciting with an enthusiastic crowd of students and locals. 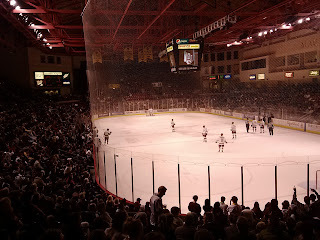 Denver 7, Alaska 1. Here are a few pics. 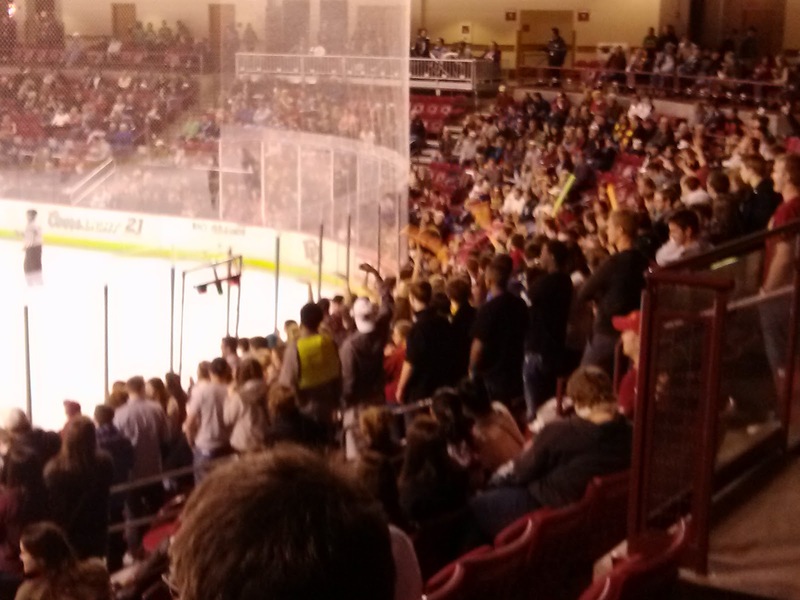 Nice crowd for a Friday night hockey game at DU. Oh, and by the way…remember when I said it was warm and sunny in Denver? The forecast for today is for up to a foot of snow. Oh well. I hope there will be rebroadcasts of Robot Combat League. Lisa does not. 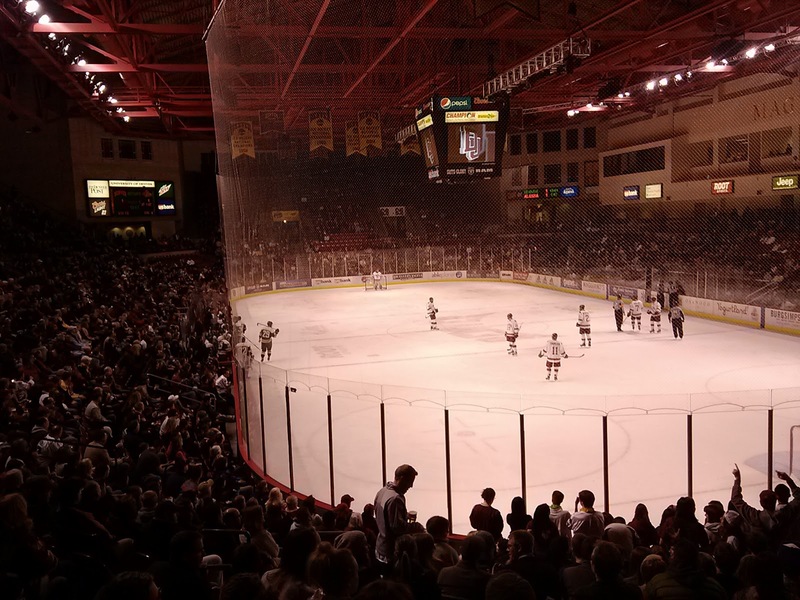 I am writing this blog entry from…wait for it!...Denver, Colorado! which, when you think about it, is a total fail of the “Getting-back-to-the-boat-in-Florida” concept. Here’s the equation: Florida=Florida! Colorado=Not Florida. But this side trip is necessary and serves only to whet our appetite to get back to Sarasota and get on with our loop. Oh, and by the way, the boat is at sea level and Denver is, as fitting of its Mile High City moniker, at 5280 feet above sea level. Lisa flew back to Denver on Tuesday, February 26th to take care of some business dealings that she has back there. I stayed in St. Louis to put the finishing touches on a few things there with the plan to join her in Denver in a few days. I wrapped up my tasks on Thursday and instead of waiting for an airplane on Sunday I decided to drive the 900 miles to Denver on Friday…in one day…in the winter…after a major storm blew through the Midwest…by myself. Let me set the stage. Our car is a Mazda RX-8 sports car. It is a really cool car that is fast, fun to drive and is only about 6 inches off the ground – not a car you would typically drive in the snow. But me, being a bit of a weirdo, decided that it would be the perfect road car to make the trip. Next, I like to drive so this idea had a great deal of appeal to me. Ah, a road trip! Fun! The trip from STL to DEN is 900 miles. It’s a sixteen hour trip and for many people this is a two day trip or a one day trip with two drivers. I was going solo with the idea of making it in one day. I packed up the evening before and went to sleep at 6:00pm. I woke up at 1:00am and was out on the road at 2:00am (central time). After grabbing a cup of coffee from the nearest gas station I sped west on I-64 out through St. Louis County to meet up with I-70 a tad west of St. Louis. I-70 runs all the way to Denver. It’s winter. It’s cold. And a major snow event had just hit the Midwest a few days before but the highways were clear the entire way. But the Mazda is a bit of a practical joker and one of its favorite little tricks is for the heater to work only when its warm outside. And it was not warm outside. It was about 15 degrees so I was pretty damn cold in the car. There was a steady mix of light sleet and snow flurries the entire way to Kansas City where dawn caught up with me. Kansas is 444 miles of, well, Kansas. The weather forecasts were for cloudy and dreary conditions for the eastern half of the state and for warmer and sunny conditions for the western half of Kansas and the entire stretch in Colorado. By the time I got to Salina, Kansas I was fully questioning my sanity. Fortunately the speed limit through Kansas is 75 miles per hour so I was able to cruise along smartly. Another distraction is that the Mazda has a rotary engine that while powerful and willing to scoot along, is not economical at all. Combine that with a fuel tank that only holds 14 gallons, I was driving on the top half of the tank, and the fact that for all intents and purposes I was driving up-hill the entire way I had to stop for fuel six times during the trip. (These stops also served the purpose of getting inside the gas station so at least my feet would warm up.) But midway through Kansas the sun did come out and the outside temperature was climbing to be very moderate. This meant that the heater was working really, really well now that I did not need it. TRIVIA TIME! People like to joke that Kansas is the flattest state in the Union. Not so. Florida has that distinction. Kansas actually has some very hilly areas, particularly in the south east and east central areas of the state called the Flint Hills. Also heading west you climb from 1000 feet above sea level at Kansas City to 3800 feet above sea level at the Colorado boarder. I pulled into the driveway of the house in Denver at exactly 4:00pm. (That’s still central time.) I made the trip in exactly 14 hours. We’ll stay here until sometime close to the end of March when we will pack the Mazda back up and head downhill to St. Louis. At that time we’ll pack up a rental car and head back down to the boat. But for now its time for layered clothing and jackets.